Most commercial candles are made with paraffin, a petroleum-based product, and are scented with chemical components. These candles release a number of potentially harmful substances into the air when burned, which have been sited by the American Lung Association as possibly dangerous to your health. Homemade, organic soy candles are an easy DIY project and offer a safe alternative to chemically based candles for your family. Purchase organic soy flakes from a local craft store. Select a container to use as a mold. Container candles are the easiest for beginners to make because they require less exact wick measurements. Juice glasses and jelly jars are recommended, but any empty container will do. Wash and dry the container completely. This will ensure that the wick will stick to the container and that there are no impurities in the candle. Glue your wick into the container. Use super glue to affix the wick base to the center of the container. Measure your wax flakes. Use a measuring cup to measure out enough flakes to fill your container. You will need to measure your wax by the ounce. If you use an 8-oz. jelly jar, for example, you will need to measure 8 oz. of flakes. Put the flakes in a pan on the stove, or in a glass bowl in the microwave, and heat until completely melted. Remove the wax from the heat, and add fragrance while the wax is still hot. There are two kinds of fragrance commonly used in candles. The first is candle fragrance, which can be purchased from a craft store, and is used at a rate of 1 oz. of fragrance per 16 oz. of wax. The second are essential oils, which should be used at a rate of a 1/4 oz. per 16 oz. of wax. Stir until the fragrance oil has been completely absorbed by the wax. Pour the melted wax into the container you have selected for your candle. Center the wick in the wax mass, and hold it in place until the wax is stiff enough to hold the wick in an upright position. 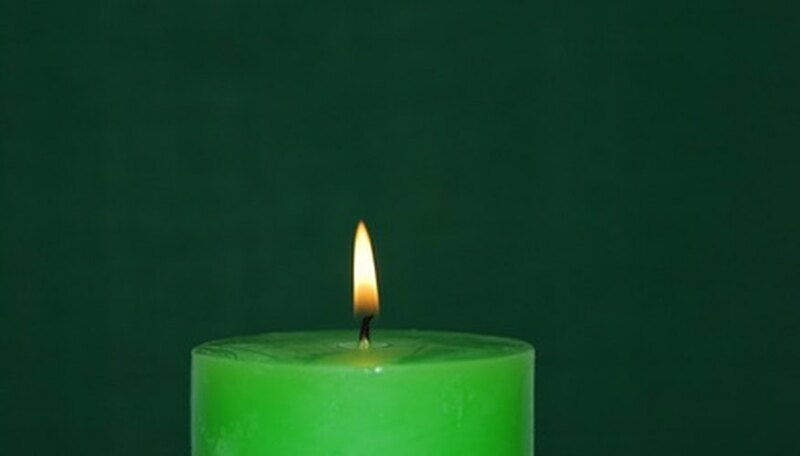 Allow the wax to cool completely before disturbing the candle, then trim the wick down so only 1/2 inch remains above the surface of the candle.